Fungi can be found in just about any habitat you care to mention, from sea water through to freshwater, in soil, on plants and animals, on human skin and even growing on microscopic crevices in CD-ROM disks! Most of the fungi you would find in these places however, are very small and would need a microscope or magnifying lenses to see. The following discussion on fungal habitats concentrates on macrofungi, that is, those with fruiting bodies big enough to be easily seen. Woods and meadows are the best places to go hunting for fungi. 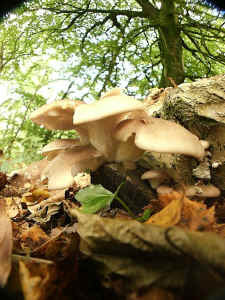 Of the two, woods are by far the best place to look, as over 80% of fungi are associated with trees. Some fungi, such as the Fairy Ring Toadstool, Marasmius oreades, and the edible field mushroom, Agaricus campestris, prefer open, grassy places. Also watch out for a different group of fungi which grow on animal dung. These tend to have very specific habitat requirements and you will usually find that particular species will grow only on a certain kind of dung, at a particular stage of decay. In order to identify the fungus, you may first need to identify the type of dung! Fungi are common in woodlands because of all the rotting wood and leaf litter, which provides a wide range of the dead organic matter which most fungi feed on. Many fungi are also associated with trees because they are linked into the tree roots. The association benefits both the fungi and the trees. This particular type of association between fungi and the roots of plants such as trees, is known as a mycorrhiza. Some fungi have very specific associations and will grow only with one kind of tree, for example, the bolete, Uloporus lividus, grows only under alders. Other fungi may be found in association with several different trees. Chanterelles, for example can be found linked with birch, pine, oak and beech trees. Soil type is also important. Some fungi may be associated with a particular tree, but only where it is growing on suitable soil. The most important factor is usually whether the soil is acidic or calcareous (chalky). Soil fertility also plays a part. Fields which have been heavily fertilised with artificial nitrates are less likely to be good mushroom hunting territory than those which have been organically fertilised. Mycorrhizae are associations between fungal hyphae and the roots of plants. Almost all terrestrial plants, including wild plants, trees and commercial crops will form mycorrhizal associations with fungi in the soil. These mycorrhizae are vitally important for the growth and health of the plants. The fungi extract food (sugars) that they need from the plants, but in return they supply the plants with some of the nutrients and water which they may require. Thus both the fungi and the plants flourish because of the association. This is known as a symbiotic relationship. Certain plants, such as orchids, are totally dependent on a fungus associated with their roots in order to grow at all. Through their enormous collecting network of hyphae in the soil, the fungi help to supply nutrients, especially phosphorus, to the plant roots they are associated with. This can have amazing effects on plant growth, particularly in soils which are not very fertile. In soils containing little phosphorus, plants with mycorrhizae have been shown to grow up to 20 times faster than those without. The survival of plant seedlings may also be up to five times greater if they have mycorrhizae to help them collect nutrients and water from the soil. Helping plants to obtain phosphorus from the soil may also give them increased drought tolerance, as this is one of the effects of improved phosphorus nutrition. Mycorrhizal fungi can often form associations with many different kinds of plants at the same time. The fungal hyphae of several different kinds of fungi may therefore be like a giant underground network connecting most of the plants in a habitat together. It is possible, although not proven, that this enables different plants to exchange nutrients between them via the fungal hyphae. If this is so then this would hugely improve the chances of seedlings surviving, because they are not just dependent on their tiny root system, but have access to the great underground collecting network. The presence of a good network of mycorrhizal fungi in the soil is therefore of vital importance for good plant growth in most habitats. Where the fungi are absent, or only present as isolated spores in the soil, plant growth will be reduced, apart from those species which do not require mycorrhizae. Most of these are what are commonly termed weed species. Mycorrhizae also help to develop good soil structure through production of a protein which helps to stick small particles of soil together to form larger ones. This means that water can move more easily through the soil and provides more air spaces and thus air, for soil organisms and plant roots. There are several different kinds of mycorrhizae. In some, the fungal hyphae actually enter the cells of the plant roots. These are called endomycorrhizae. There are several different kinds of these endomycorrhizae, of which a type abbreviated to AM (Arbuscular Mycorrhizae), is perhaps the best known. Eighty percent of the world's plant species, from grasses, to trees, most crop plants, shrubs and flowers, form AM associations. 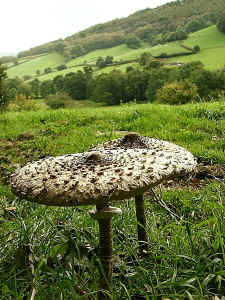 Another type is called an Ectomycorrhiza (ECM). In this kind, the fungus forms associations with plant roots, but does not actually enter the root cells. This kind is mostly formed with different types of trees, such as pines, firs, spruces and oaks, amongst many others. ECM fungi may form thick hyphal strands known as rhizomorphs which can conduct water and nutrients relatively long distances. Many of the fungi common in woodland are ectomycorrhizal fungi, with mushroom or toadstool-like fruiting bodies.